One of the essential processes that Cloud adoption requires is a formal framework for Cloud Portfolio Management (CPM). Cloud portfolio management provides a means by which an organization can control and govern existing services, new services, and well as the Cloud providers and the relationship with them. The rapid adoption of Cloud has meant that a management framework and approaches necessary to manage the Cloud adoption process have lagged behind internal adoption of Cloud computing. This is normal. However, as Cloud adoption has raced ahead of internal oversight and management processes, the gap has created a need to rebuild and re-assert control over Cloud adoption. In the first Blog post on the topic of Who Needs a Cloud Portfolio Management Strategy, we explored the state of the Cloud computing industry, and the drivers for the need for the discipline of Cloud Portfolio Management. This post will explore the key requirements for this emerging and critical management process. Given the context in which Cloud Portfolio Management is emerging, we will explore the requirements for this emerging discipline. Avoid vendor lock-in by ensuring choices between CSPs in your provider portfolio; do not commit to one strategic partnership. Developing and managing a portfolio of Cloud service portfolios is the first step toward a discipline of Cloud Portfolio Management. However, it is not enough. Deepening the relationships between key providers requires more than mere vendor management, as we discuss next. Provider Relationship Management (PRM) is a necessity as part of the process of Cloud Portfolio Management. Developing and fostering relationships with your providers will pave the way for successful Cloud adoption within your enterprise, and help generate the value that the Cloud offers. Manage service equivalents across CSPs: For key and heavily-used Cloud services, you will want to ensure you have functionally-equivalent services that support the most common use cases, such as Development and Testing, Storage, compute and others. Provide cost-effective service equivalents for redundancy: In addition, you should gather and publish current pricing information for your common service equivalents, which will allow you to select the best fit services based on price and performance benchmarking data. As Cloud Spectator has demonstrated in its price-performance reporting, the best value service for your application or workload needs may not be the cheapest service. Compare compute, storage and network performance, costs and value across CSPs: As you analyze your services portfolio, be sure to gather performance analytics to go along with pricing data, such that you can continually evaluate the relative performance of service equivalents in your portfolio. This information can be provided in real-time through your catalog to help consumers select the best fit services for their needs. 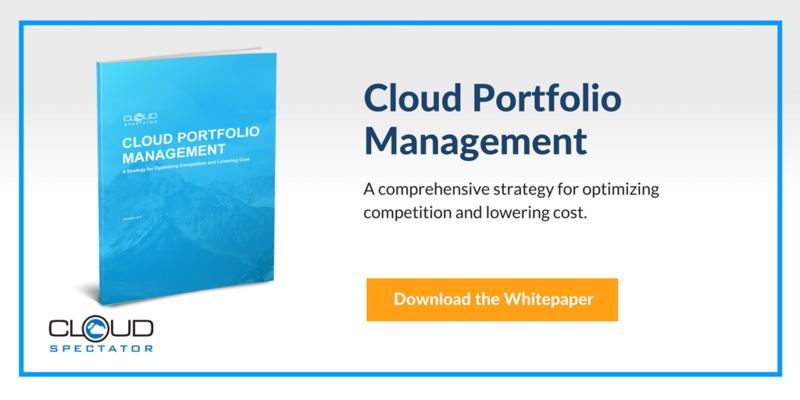 Managing your Cloud services using portfolio management best practices will help ensure the best Cloud solutions and services are available to your internal consumers, as well as providing the basis for Cloud pricing arbitrage. Cloud Portfolio Management is based on using modern testing tools to gather pricing, performance and value data (combination of priced and performance), and then using that information to manage the Cloud provider relationships, SLAs, and the portfolio of Cloud services. Recently, innovations in the price-performance benchmarking space allow enterprise users to test Cloud applications and workloads using these testing frameworks, and then perform workload modeling and simulation using various targeted Cloud Service Providers. The workload simulation provides a real-world operational view of how specific workloads will perform in a given CSP’s Cloud, as well as providing the runtime pricing for those workloads using the specific Cloud services. This approach will provide the foundation for price modeling and cost forecasting for Cloud services, which will be invaluable for IT Finance in negotiating and managing costs, as well as for procurement in managing the CSP contracts. Ultimately, these portfolio management tools will provide the ability to support Cloud service arbitrage based on real-time or near real-time pricing data. Having a true price-performance engine will enable developers and IT leaders to plan Cloud costs over time, and to make both near-term and long-term decisions about which CSPs and which services to use for key applications, Cloud use cases and targeted workloads. Cloud Portfolio Management process definition, implementation and management: The skills and expertise in performing Cloud Portfolio Management, quite simply, do not widely exist. There are core knowledge and process requirements that can only be obtained with experience in managing diverse services in a multi-Cloud ecosystem, and achieving the optimal portfolio mix. Cloud Portfolio Management tools and enablers: Cloud Portfolio Management requires new technologies, tools and enablers to augment the Service catalog with real-time pricing data, historical benchmarking data, price-performance comparisons. These tools involve backend integration with CSPs, gathering pricing and performance data in real-time, and being able to normalizer and compare that data to support Cloud Portfolio Management needs. Cloud Portfolio Management resources and managed services: Increasingly, the discipline of Cloud portfolio management will be provided as a managed service as an adjunct capability to the Cloud PMO or Cloud management office. Enterprise Cloud Portfolio Management services will be acquired as a bundle of staffing resources and technology enablers that provide the ongoing management support to end-user enterprises. Cloud Portfolio Management is expected to be a critical requirement as Cloud adoption continues, and as more Cloud services are consumed within enterprises via hybrid multi-Cloud deployments. Finding the skills support resources will be challenging. Below, we offer some actions that CIOs, CTOs and their leadership teams should pursue to prepare themselves for the rapid transformation of IT based on the forces of change we have described above. Begin the process of Cloud Portfolio Management (CMP): Perform baseline analysis of your Cloud providers and their respective services, and begin to profile enterprise usage of the various services. Assess your CSP and Services mix to optimize competition and hedge your bets: Based on analysis and empirical data, determine what the optimal provider and service mix might look like based on your Cloud strategy and planned consumption. Assure competition in your Cloud marketplace through provider mix optimization: Do not over-rely on a single hyperscale Cloud provider. If you are a Microsoft shop, engage with a hyperscale alternative. If you have multiple hyperscale providers, add some smaller CSPs into your mix. Create healthy competition in your service and provider mix. Plan for functionally equivalent services for fallback purposes: Using 80/20 analysis, ensure you have functionally equivalent services for the most-consumed Cloud services in your portfolio. Provide real-time pricing information to your internal consumers on the price-performance and SLA performance of these services in order to inform your users. Use a Data-Driven Approach to Cloud Portfolio Management: Perform a Cloud price-performance benchmarking analysis of all Cloud services in your enterprise – public and private. Know your costs, prices and performance, and use a data-driven approach to manage your Cloud ecosystem.